In June 2017, Cleanaway won a major contract to manage and operate four Brisbane resource recovery centres from 1 July 2018. The sites collect more than half a million tonnes of metal, timber and abrasive hard rubbish per year from municipal self-haul and kerbside collection, along with green and general waste. To ensure it could service the requirements of the new contract, Cleanaway acquired $22 million worth of trucks, trailers and heavy equipment. As part of this upgrade, the company also purchased new wheel loaders and bulldozers that could handle the harsh materials and putrescible waste at the sites. 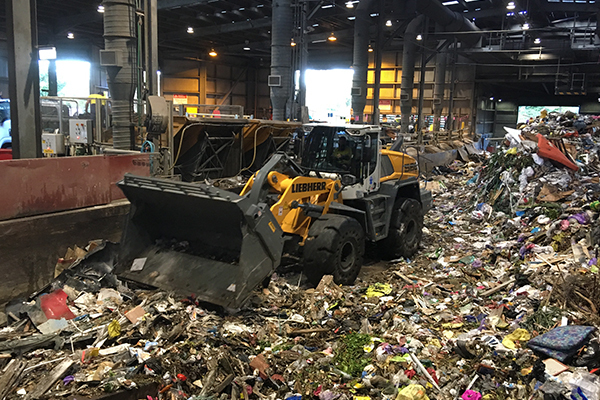 Eight new machines were purchased from equipment manufacturer Liebherr-Australia, including two dozers to manage waste at the larger sites and six front end wheel loaders of various sizes to aid resource recovery operations. Paul Findlater, Liebherr-Australia National Key Accounts Manager – Earthmoving & Material Handling Division, says Cleanaway needed machines that could work efficiently and perform in a harsh waste industry. “The machines needed to be suitably guarded and protected against foreign material including timber, metal and glass that they would be working in,” Paul says. “The wheel loaders in particular were fitted with solid tyres to prevent punctures disabling the machines as they carry out their daily tasks when driving over the waste,” he adds. Additional armour and guarding has also been added to the machines, with the track dozers having a protected undercarriage and extra plating to protect internal systems from damage. The vehicles use a hydrostatic driveline configuration which aims to provide an efficient method of transferring power from the engine to the drivetrain which provides improved fuel economy for the machines. Paul says the environment in the areas where the machines would be working was often hot, dusty and dirty, which is why they were designed to operate in elevated temperatures. “The machines are resistant to overheating thanks to a wide fin spacing of the heat exchanges and the automatic reversing engine fans,” he explains. Fire is a potential risk in any hot environment near flammable materials. All it could take to start a fire is a spark from metal hitting metal or combustible materials reaching hot surfaces, which is why a fire suppression system was fitted into each of the machines. If the system’s sensors detect a fire on, in, or near the machine, it will shut down the engine and can then douse itself in water to protect the vehicle, operator and surrounding environment from potentially igniting. This feature can be manually activated in an emergency. Ben Arthur, Cleanaway Alliance Operations Manager, says one of the most important benefits the vehicles offer is low noise output. “The wheel loaders are working mostly indoors in a tin shed in close proximity to our staff and customers. Even though the vehicles are just metres away, there is relatively little noise and almost no issues with reverberation, helping create a pleasant working environment,” Ben explains. “On top of this they’ve also got the latest generation of Tier IV final engine emissions. Comfort was also a priority for Cleanaway as operators could be spending hours at a time working inside the vehicles. Air conditioning and ergonomic seating helps to keep the cabin pleasant when temperatures outside potentially reach more than 45 degrees Celsius. High-powered LED lighting have also been installed on the vehicles to maximise visibility and safety in the indoor, dusty environment. Ben says that Liebherr-Australia’s specialised waste offering for the vehicles had impressed the team at the site, who had considerable experience with what a wheel loader or bulldozer would need to handle. “The staff were impressed by the durability of the modified vehicles and confident they could withstand the common damage from the materials they handle,” he adds. Liebherr-Australia operates in all major cities around Australia with the exception of Darwin, meaning they are able to provide support with Cleanaway on a national level. Ben says that Liebherr-Australia also provides full service and maintenance on the machinery through a contract maintenance agreement with Cleanaway.